Apple Pie Pancakes is the best pancakes recipe for those of you who love fall! 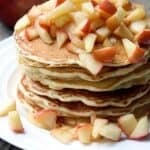 These apple pancakes are fluffy, sweet, and delicious! Here’s the thing: one of my most popular recipes of all time on the blog is my Pumpkin Pancakes with Cinnamon Syrup. They’re amazing, and I knew if so many people loved that recipe, than I just had to share these Apple Pie Pancakes!! If you’re a lover of breakfast foods and a lover of fall, do yourself a favor and make these…SOON! They’re another one of my all-time favorite fall pancake recipes! They have actual grated apple in them, plus a bunch of other delicious fall spices, and the end result will melt in your mouth! 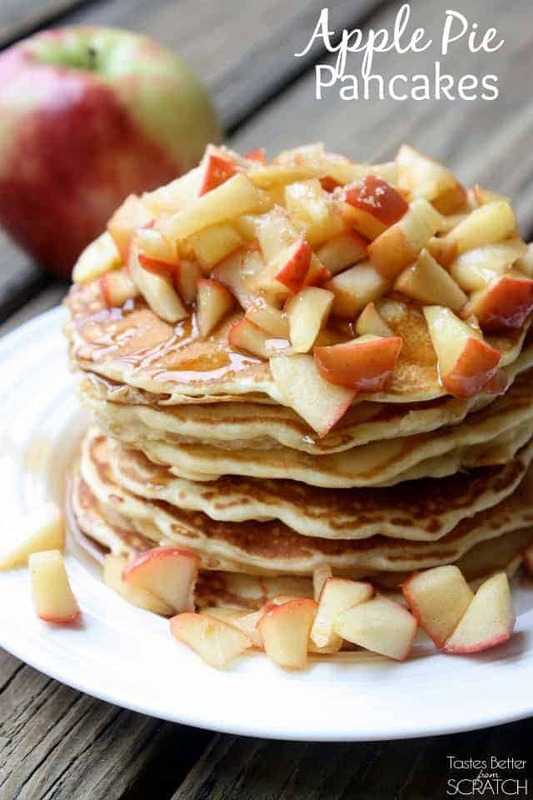 Apple pie pancakes is especially for those of you who love fall! They are fluffy, sweet, and delicious! In a medium bowl, whisk together the flour, brown sugar, baking powder, cinnamon, nutmeg, clove and salt. In a separate small bowl combine the milk, egg, butter and vanilla and beat to combine. Preheat your skillet over medium heat and grease lightly with butter or cooking spray. Add the wet ingredients to the dry ingredients and mix just until combined--don't over mix, the batter should have some small lumps. Gently fold in the grated apple. Spoon about 1/4 cup of batter for each pancake. Cook until small bubbles form on the surface of the pancakes (2-3 minutes), and then flip and cook on the opposite side until golden brown. For the topping, combine diced applies, brown sugar, sugar, butter and cinnamon in a small saucepan. Cook over medium heat until apples are slightly softened (about 5-8 minutes). Serve pancakes immediately with diced apple topping and your favorite syrup. These pancakes look like perfection! I want to try these. And talk about an amazing photo! These look amazing and PERFECT for Fall! This looks so good! I love pancakes so much better with fruit! These look amazing but wanted to ask if the whole milk was needed or can I use lactaid? I have a couple of people that cant have dairy but would love these!!! These were a delicious fall dessert. I went apple picking over the weekend and have been looking for ways to use my apples. These were FANTASTIC!